In order for a Mac (running OS X) to communicate with a Windows machine on the same network, it needs to use the same workgroup as the Windows computer. Its not obvious how to change it, but the following steps will show you how to do it. Open the main drive and then open the Applications folder. Click on the padlock so you can log in as administrator. You won’t be able to modify the items until you log in. Click on SMB/CIFS and press the Configure button. In Workgroup, select or type the WorkGroup used by the Windows computers. Press the padlock to prevent unauthorized users from making changes to these settings. You should now be able to access the Windows network. It may take a few minutes before the network will recognize the Mac. A virus scanner is no longer an optional utility to have running on your computer. Its absolutely essential considering the vast number of viruses in circulation that threaten us daily. The problem is that once a virus scanner is installed, there is no way of knowing if the software actually works. You can test it by finding a virus and copying it to your hard disk, but most people would be somewhat hesitant with installing software that could potentially destroy their computer. An alternate and safe method of testing the scanner is with the EICAR test file. It was developed by the European Institute for Computer Antivirus Research for testing virus scanners. This program isn’t a real virus, but every virus scanner (at least the major ones) have it in their virus definition file and it will trip the scanner. Once detected, the virus scanner will either delete or quarantine it depending on its settings. You can even run the program from the command prompt which will display a string describing the program. I’ve made the EICAR test file available here. 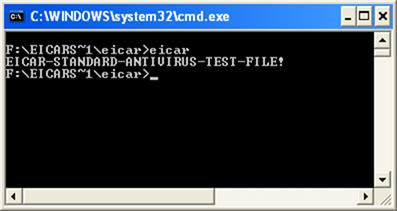 The zip file has a password (eicar) to prevent a virus scanner from reading the archive and then deleting the file inside. A tutorial on how it works (which includes an introduction to x86 assembly language) can be found at An Examination of the EICAR’s Standard A-V Test Program page. Have you ever noticed the little icons beside the URL in the address bar in your web browser? These are favicons and they also appear in your bookmarks when you save the web site there. Most web sites don’t use favicons and have just the blank, default icon there instead. Its actually very easy to create these images. An .ico file is a raster format used for icons in Microsoft Windows. You can create it with a plugin from Telegraphics for the Windows or Mac version of Photoshop. Corel PhotoPaint can also save Windows .ico files. If you don’t know how to use an image editing program, you can create an icon with Favicon Generator. This is a free, online application which takes any 100 pixel by 100 pixel image and converts it into a favicon. Installing a WordPress plugin can be somewhat stressful for those who are unfamiliar with web design or programming. There are many plugins which require you to go into the PHP source code of a WordPress module and then add the function to call the plugin. Normally, the instructions just tell you to enter the function name. This works well until you deactivate or uninstall the plugin. You need to remove the PHP code you added to your blog or you’ll get an error message, or worse, the page may fail to render! One way to get around this is to use function_exists () with the plugin. This is a PHP function which will return a true value if the function that its trying to run exists. This may seem confusing, but the following code will make it easier to understand. This checks if the function to call the plugin (which is named wp_plugin) is active (or installed). If it is, then it will run the function wp_plugin (). If the function could not be found, then no command will be run and the next statement after wp_plugin () will be executed. You need to ensure that you enter ‘wp_plugin’ and not ‘wp_plugin ()’ in function_exists for it to work properly. If you wrap the plugins that you install this way, you can easily turn on and off the plugin and still have a fully functional blog.